Born Thomas Lanier Williams on March 26, 1911, in Columbus, Mississippi; died on February 25, 1983, in New York City. America's most famous playwright, Tennessee Williams, first met Paul and Jane Bowles in Acapulco, Mexico in 1940, when he was still unknown. 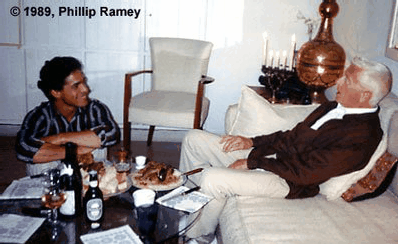 In subsequent years, he made occasional visits to see Paul and Jane Bowles in Tangier, where he sometimes wrote at the Sun Beach, a beach-front restaurant and where could also eat and drink while enjoying the ocean views and sunshine. Williams wrote the play Cat on a Hot Tin Roof at the Sun Beach while on vacation in Morocco, and the actual setting for Cabeza de Lobo in his 1958 play Suddenly, Last Summer was the tranquil seaside town of Asilah, Morocco. Suddenly, Last Summer was later adapted into a successful film in 1959 by Columbia Pictures, with the screenplay co-written by Williams and Gore Vidal. 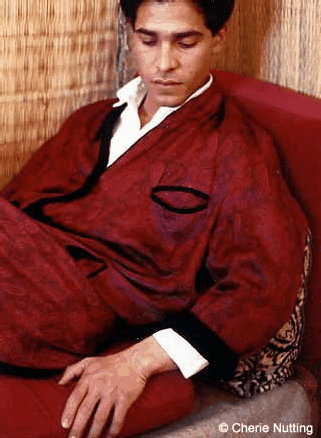 The film starred Elizabeth Taylor, Katherine Hepburn and Montgomery Clift, with a cameo appearance by Gore Vidal, who was also a friend of Paul Bowles..
Tennessee Williams in Tangier, written by Mohamed Choukri, was translated into English by Paul Bowles, who closely collaborated with Choukri on the translation. The work was first published by Cadmus Editions in 1979. In May 1973 when Williams learned that his dear friend Jane Bowles had died and that there had been no printed obituary in the New York Times, he demanded that the newspaper print an announcement, which it did almost three weeks after her death. Williams then named the gazebo at his home at 1431 Duncan Street in Key West, Florida, "The Summer House" in her memory. 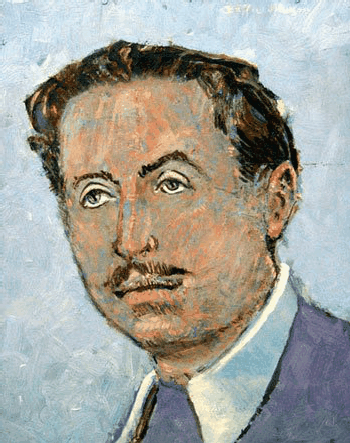 This portrait entitled "Tennessee Williams, Provincetown" (oil on canvas), was painted in 1947 by the distinguished American artist Buffie Johnson, a close friend of both Tennessee Williams and Jane and Paul Bowles. The painting was acquired in 2007 by The National Portrait Gallery of The Smithsonian Institution in Washington, D.C. 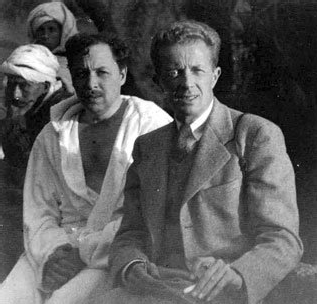 Throughout his life, Tennessee Williams remained a devoted friend of both Jane and Paul Bowles. He wrote the introduction to Jane Bowles' "Feminine Wiles", published in 1976. 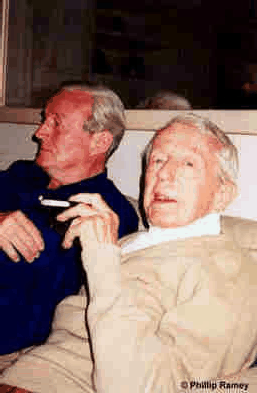 Paul Bowles wrote the music for four of Williams' plays, beginning in 1944 with "The Glass Menagerie", followed by "Sweet Bird of Youth", "The Milk Train Doesn't Stop Here Anymore" and "Summer and Smoke". Shortly after Jane Bowles died in 1973, he named the gazebo at his house in Key West, Florida, specifically at 1431 Duncan Street, the Jane Bowles Summerhouse, in memory of his dear friend. In early December 1948, Paul Bowles, Tennessee Williams and Frank Merlo traveled on the SS Saturnia from New York to Gibraltar, and were greeted by Jane Bowles. After an spending the night in Gibraltar, they then took a ferry boat across the Strait of Gibraltar to Tangier. 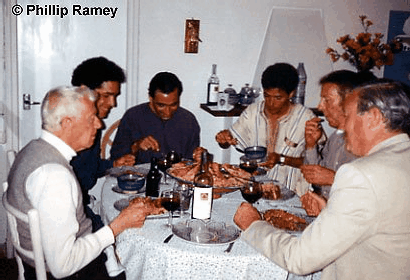 On Christmas Eve, Williams and his companion Frank Merlo drove Paul Bowles and Ahmed Yacoubi to Fez, leaving Jane Bowles behind in Tangier. Gavin Young was born on April 24, 1928 in Bude, Cornwall, England and spent his youth in southern Wales. Young studied modern history at Rugby and Trinity College at Oxford. In 1950 at age 22, after military service in the Welsh Guards, mostly in Palestine, he worked for two years with a shipping company in Basra, Iraq, and learned some Arabic. Young later moved to southern Iraq where he lived with the Marsh Arabs, in the area between the Tigris and Euphrates rivers. Still later, he lived in the mountains and plains with the people of the southwestern Arabian peninsula. 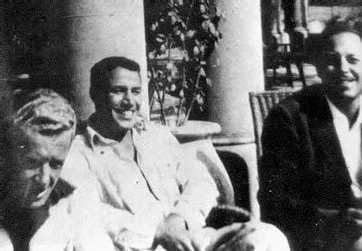 In Tangier, during the early 1950s Gavin Young befriended Ian Fleming, then on leave from London's Sunday Times, when Fleming was writing his first James Bond novel, Casino Royale, at Tangier's El Minzah Hôtel. Beginning in 1959 Gavin Young worked for Radio Maroc in Rabat, Morocco. While in Tunisia in 1960, Gavin Young joined the staff of The Observer as a foreign correspondent, and for the next 20 years he covered fifteen wars and revolutions throughout the world. His first book, Return to the Marshes: Life with the Marsh Arabs of Iraq (Wm. Collins & Sons. Co., 1977; Arrow/Random House UK, 1983), the basis for a 1979 film, is about the people who inhabit the ancient lands of Sumer and Babylonia. Young's second book, Iraq: Land of Two Rivers (Wm. Collins & Sons. Co., 1980), is his account of a journey through the historic landscape of Mesopotamia. Young's around-the-world travels by sea provided the basis for his bestselling classic books Slow Boats to China (Penguin UK, 1980; Hutchinson, 1981; E. P. Dutton, 1984; Penguin Books Ltd., 2001)) and Slow Boats Home (Penguin UK, 1983; Random House, 1986). From Sea to Shining Sea: A Present-Day Journey Through America's Past, was published by Hutchinson and Random House (UK) in 1995 and by Penguin, New York in 1996. In 1999, Penguin UK published Eye on the World: A Celebration of a Lifetime's Travel to the World's Most Exotic, Beautiful and Dangerous Places; and A Wavering Grace: A Vietnamese Family in War and Peace (Viking, 1997). Other works by Gavin Young include Beyond Lion Rock: The Story of Cathay Pacific Airways, Halfway Around the World: An Improbable Journey, Worlds Apart: Travels in War and Peace, Something of Samoa and In Search of Conrad. Unusual for a journalist and war correspondent, Gavin Young was made a Fellow of the Royal Society of Literature. He was also a member of the Foreign Correspondents' Club, Hong Kong. 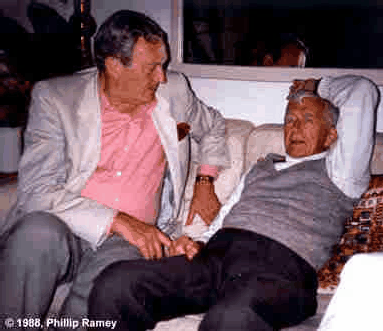 Gavin Young died in London, England on January 18, 2001, at age seventy-two. 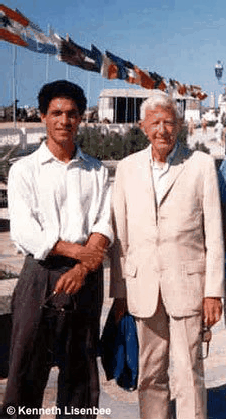 The Guatemalan writer Rodrigo Rey Rosa with Paul Bowles in Asilah, Morocco, 1987. Rey Rosa is the literary heir of the estate of Paul Bowles and Jane Bowles. Next (Part Two); Part Three; Part Four; return to galleries listing.